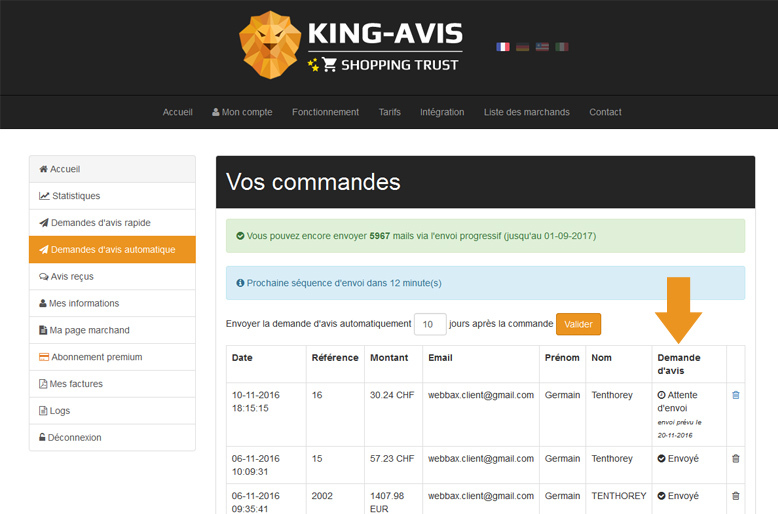 The procedure for adding King-Avis to your Prestashop store is easy but requires a few steps. Begin by creating a merchant account on King-Avis in the My Account section. Following this, you will be able to download the Prestashop module using the button below and install it in your Prestashop back-office. Once the Prestashop module has been installed, you will need to configure the "Merchant ID" and "Merchant Token", which you can find on the landing page of your account. You simply need to add these two pieces of information to the Prestashop module. 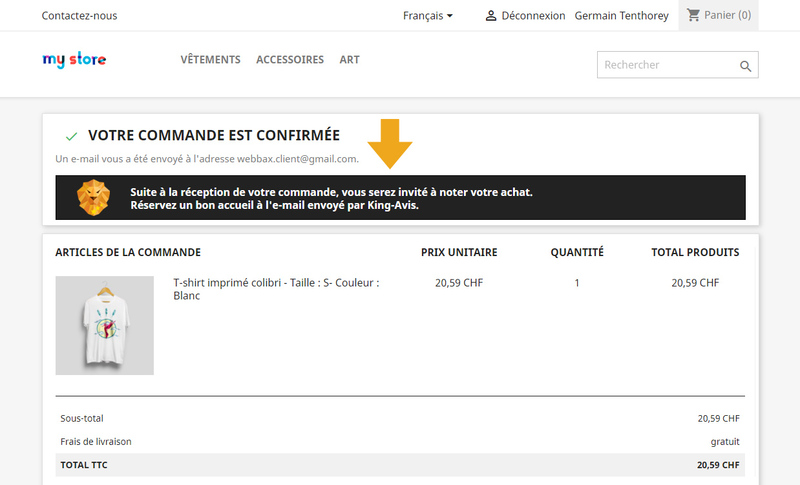 Regarding the option "Hide the King-Avis confirmation below the order" (unchecked by default), this means that clients who purchase through your store will see a notice about King-Avis after their order information telling them that they will later be requested to give their opinion about the items they purchased. Currently, when you view the public part of your store, you should see the King-Avis widget displayed on the bottom right of your screen. This widget is permanent and will be displayed in this location on all platforms, including tablets and mobile phones. You can quickly begin receiving reviews by exporting a CSV file of your existing orders using the Prestashop module. 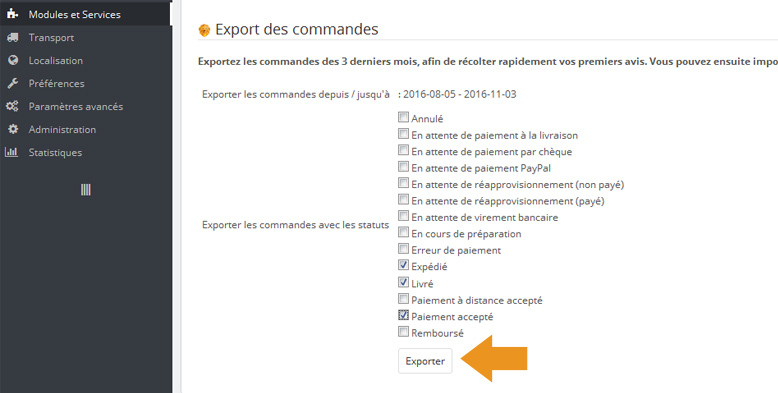 The export will be done automatically for the last 3 months. This is useful if you already have a store which is receiving orders. Once the file has been generated, you can import it into your King-Avis back-office. Once the Prestashop module has been installed, reviews will automatically be collected. 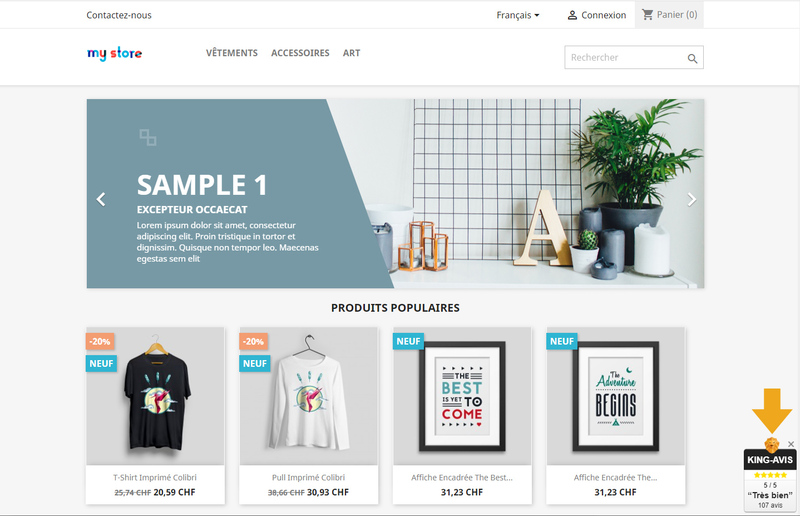 Each time a new order is placed with your store, an email requesting an evaluation once the order has been received will be sent to your client. Under the "Automatic review requests" tab, you will be able to view all current and past requests for review.